Here are the results for the 2012 awards (for works published in 2011). The jury has elected to give two Honorable Mentions in each category. The winners were announced today at Finncon 2012, held in Tampere, Finland. The awards were announced by jury member Irma Hirsjärvi and ARESFFT Board member Cheryl Morgan. The money for the prize fund was obtained primarily through a 2011 fund-raising event for which prizes were kindly donated by George R.R. Martin, China Miéville, Cory Doctorow, Lauren Beukes, Ken MacLeod, Paul Cornell, Adam Roberts, Elizabeth Bear, Hal Duncan, Tansy Rayner Roberts, Peter F. Hamilton, Ann & Jeff VanderMeer, Nalo Hopkinson, Juliet E. McKenna, Aliette de Bodard, Nicola Griffith, Kelley Eskridge, Twelfth Planet Press, Deborah Kalin, Baen Books, Small Beer Press, Lethe Press, Aeon Press, Jon Courtenay Grimwood, Kari Sperring, Helen Lowe, Rob Latham and Cheryl Morgan. The jury for the awards was Dale Knickerbocker (Chair); Kari Maund, Abhijit Gupta, Hiroko Chiba, Stefan Ekman, Ekaterina Sedia, Felice Beneduce & Irma Hirsjärvi. Out thanks to the various publishers who have made these stories available. We are in discussions with Comma Press and PIASA Books regarding the other two stories and hope to have good news soon. We have been contacted by Gudrun Östergaard to let us know that she received invaluable assistance in translating her story, “The Green Jacket”, from Danish translator Lea Thume. At Gudrun’s request we have updated the nominee lists to add Lea’s name. We are delighted to announce the finalists for the 2012 Science Fiction and Fantasy Translation Awards (for works published in 2011). There are two categories: Long Form and Short Form. The nominees were announced at Åcon 5, a joint Finnish-Swedish convention, over the weekend May 19-20. The announcement was read by Guest of Honor, Catherynne M. Valente. The winning works will be announced at the 2012 Finncon on the weekend of July 21-22. Each winning author and translator will receive a cash prize of US$350. ARESFFT Board member Cheryl Morgan and jury member Irma Hirsjärvi will be present to make the announcement. Hugo Award nominated writer, Ken Liu, is also a keen translator of Chinese fiction. His latest project is “Taking Care of God” by the popular Chinese science fiction writer, Liu Cixin. You can read it in issue #2 of the free ebook magazine, Pathlight. As you will have noticed, if you clicked through, that issue of Pathlight was issued in conjunction with China being the Market Focus for this year’s London Book Fair. One of the events of the fair saw John Clute and Jonathan Clements talk about Chinese science fiction. Liu Cixin was mentioned, as was Tibetan writer, Ah Lai. Our fundraiser is now over. We need to check through the accounting as money has come in from a variety of sources, but the provisional total is $2001.65. Thank you ever so much. We will be in touch with the prize draw winners in the next week or so. Here’s a final update on the fund raiser before it comes to an end at midnight tomorrow (Feb. 29th). We have currently raised $1,474.65. That’s a bit down on last year, so if we can get an extra $300 before the deadline we’d be very pleased. If we make it to $2000, which was our goal, we’ll be delighted. Everyone who donates money will go into a draw for one of those prizes. The full rules of the draw are available here. If you are a new visitor, more information about our organization can be found here; and more information about the awards is here. To donate, simply use this PayPal button. You are able pay with a credit card. With just over a week to go in our fund raiser, here’s how we are doing. So we are still short of last year’s total, but those of of who have donated stand a better than 50:50 chance of winning something. To see the list of prizes, and find out how to donate, click here. Wesleyan University Press have sent us a copy of a new book containing translations of three novellas by Belgian author, J.-H. Rosny Aîné (Joseph-Henri Boëx, 1856–1940). A contemporary of Verne and Wells, Rosny Aîné is largely unknown in the English-speaking world, but had a key role in the development of science fiction. Like Wells and Olaf Stapledon, he had a fascination with the long-term evolution of humanity. He was also the first writer to try to imagine intelligent beings who are truly alien, as opposed to just humanoids from another world. “The Xipehuz” is a prehistoric tale in which the human species battles strange geometric alien life forms. 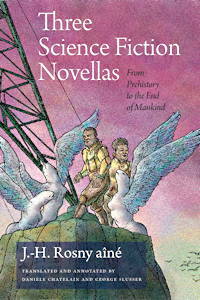 “Another World” is the story of a mysterious being who does not live in the same acoustic and temporal world as humans. “The Death of the Earth” is a scientifically uncompromising Last Man story. The translators, George Slusser and Danièle Chatelain, are well known for their studies of French literature. Professor Slusser is also the curator of the Eaton Collection of science fiction at the University of California, Riverside. The pair also contribute a lengthy introduction covering Rosny Aîné’s career and his influence on the genre.